We come across variety of fragmented ideas related to the Philosophy of Charvaka in name of Bhutacaitanyavadi, Lokayatika, Akriyavadi and so on. But the Tattvopaplavasimha of Jairashi Bhatta is the only text available in Indian tradition which claims to rediscover the tradition of Brihaspati, supposed to be the founder of Charvaka Philosophy. 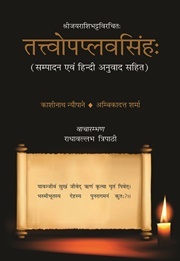 It is, for the first time, a complete Hindi translation of the Tattvopaplavasimha is brought out by two well-versed scholars of classical Indian Philosophy. This translation, with a close hermeneutical rendering of the text, provides a convincing structure of dialectical as well as sceptical deconstruction of all the major systems of Indian Philosophical thoughts. Its study leads a reader towards a radical support of Charvaka ideology by declaring the annihilation of all principles.